Meetings at the Edge is a series exploring my role and experiences as an art therapist. It has been an honor, a privilege, transforming, awe inspiring, painful and difficult. I have come to have a great respect for the wisdom and healing power within everyone no matter what circumstances they find themselves. This is the first piece in the series and speaks to the yin and yang of life, the bitter and the sweet, the lightness and the darkness. As human beings we have many experiences that are built upon each other, layer upon layer. People seek therapy or are referred to therapy often because there is something overwhelming and unbearable happening which could be an external event but is amplified by the inner landscape and history of the person. My role as a therapist is to meet the person in the present moment and to try to help untangle, simplify, examine, and clarify what is happening both internally and externally. As a therapist I attempt to meet another at the edge of their experience in this accepting, neutral place and to examine things piece by piece. occurs. That is where the energy, new growth and healing occur. 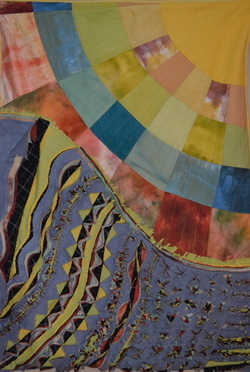 So far there are five other pieces in the series which include quilts, an altered book and mixed media. I find it important to express my own feelings and what I learn in working with others.